Momentum is building across America, and we are not the only lawyers who are stepping up. Yesterday, 18 attorneys general joined the fight to reunite the more than 2,000 children who are suffering under the inhumane family separation directive. We thank the AGs in California, Delaware, Iowa, Illinois, Maryland, Massachusetts, Minnesota, New Jersey, New Mexico, New York, North Carolina, Oregon, Pennsylvania, Rhode Island, Vermont, Virginia, Washington, and the District of Columbia for their leadership. Also yesterday, a federal judge in California ordered a halt to most family separations at the US border and the reunification within 30 days of all families that have been separated. The order makes special provisions for children younger than 5 and allows parents to speak to their children within 10 days. We thank the American Civil Liberties Union for bringing suit and the court for recognizing the importance of this issue and the need for a nationwide injunction. These are meaningful steps toward righting this wrong. This crisis already has created a dark stain on the history of this country, and American voices are rising up to end this policy that is not only morally abhorrent but also against the law. But we are not there yet. Lawyer Moms of America urges our members and allies, the attorneys general, the ACLU, and others to continue this fight until we prevail in permanently ending the cruel policies of family separation and family detention and reunite all separated migrant children with their families. These children need their parents, and it is imperative that we get them back where they belong. Lawyer Moms of America applauds the American Bar Association for its efforts to educate on and advocate for the rights and protections of separated migrant families and all individuals seeking asylum in the U.S. We are honored to share this video that ABA President Hilarie Bass made for Lawyer Moms of America, thanking all of YOU for your tireless work on these issues. She says she made a promise to women she met at a border detention center that the lawyers of America will.not.rest until every one of them is reunited with their children. Please visit https://ambar.org/immigrationjustice for more info on the ABA’s family separation and detention initiative. Here is Senator Tim Kaine with our very own Natalie Roisman at St. Elmo’s Coffee Pub in Alexandria, Virginia this morning. He was taking the time to meet and hear from local women activists. Thank you Senator Kaine for all the work you are doing! 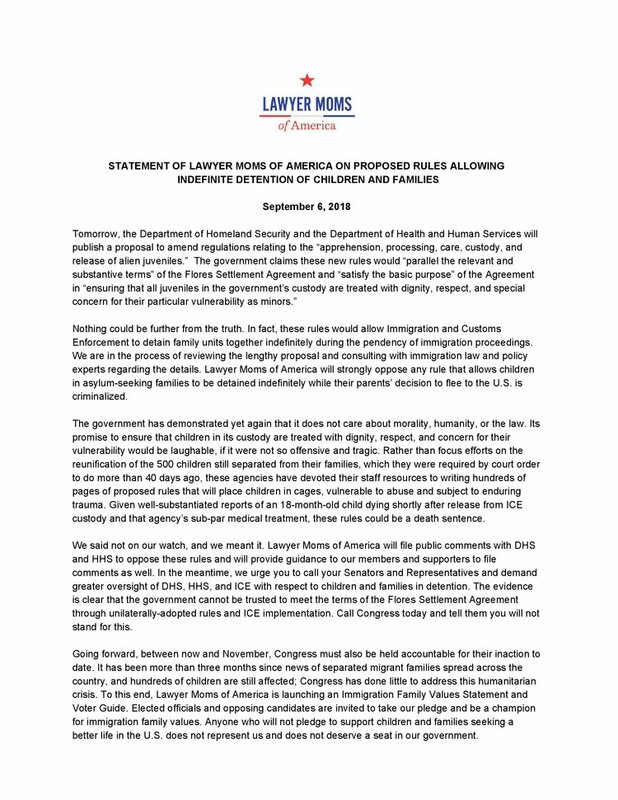 On November 6, Lawyer Moms of America filed comments opposing the DHS and HHS proposal to replace the longstanding Flores Settlement Agreement (“FSA”) with rules that would allow for indefinite detention of asylum-seeking children with their parents. (The full comments can be found here.) The proposal also would eliminate state licensing requirements for ICE family detention facilities and allow ICE to set the standards of care for private contractors operating such facilities. This regulatory proceeding is the latest front in the Trump Administration’s all-out war on immigrants, asylum-seekers, and refugees. More than 65,000 comments were filed. Lawyer Moms of America told the government: THIS PROPOSAL CANNOT STAND. DHS and HHS have shown that they deserve more oversight, not less; less autonomy, not more. The government wants to lock up families in prison-like facilities for indefinite periods under “standards” of “care” established by an agency with a documented history of causing trauma, allowing abuse, providing sub-par medical treatment, and incapable of even ensuring safe drinking water for those in its custody. This is unthinkable. The Administration seems to have learned nothing from the vast public outcry and sharp judicial rebuke regarding its immoral and inhumane family separation policy. The American Academy of Pediatrics’ February 2017 report on family detention makes clear that DETENTION CENTERS AND CAMPS ARE NOT SAFE PLACES FOR ANY CHILD. Thus, although the government claims that the proposed rules would “parallel the relevant and substantive terms” of the FSA and “satisfy the basic purpose” of the FSA in “ensuring that all juveniles in the government’s custody are treated with dignity, respect, and special concern for their particular vulnerability as minors,” nothing could be further from the truth. With this proposal, the government demonstrates yet again its blatant disregard for morality, humanity, and the law. It is a wolf that cannot even be bothered to fully don sheep’s clothing; a fox that seeks not only access to the hen house but to be the sole holder of the keys. Eliminating basic state licensing requirements for family detention facilities in favor of self-licensing would dismantle established protections for children in custody. Without accountability standards, there is no way to ensure conditions of care would meet current minimum standards for keeping children safe. Making matters worse, the government proposes to enter into contracts with for-profit companies to administer new family detention facilities. This shamelessly transactional Administration thus will be motivated to keep children and families in detention longer, resulting in more money for profiteers. Immigration policy is complex, but the absence of consensus on comprehensive and effective reform does not give this Administration license to devalue the lives, health, security, and humanity of people seeking refuge within our borders. As Americans, we should all be able to agree on some basic human rights: children should not be ripped from their parents’ arms simply because the government wants to be cruel, nor should children and families be thrown in jail indefinitely while fleeing extreme violence, instability, and poverty. Detaining children for months (or years), with or without their parents, just because they are seeking safer lives, would render moot the words on the base of the Statue of Liberty. Families facing persecution in their home nations are entitled under domestic and international laws to seek asylum in this country, and asylum seekers are entitled to humane treatment. The proposal also exposes the Administration’s sham claims of fiscal responsibility. New family detention centers could cost billions of dollars, and the government has not sufficiently considered viable and less costly alternatives to detention. DHS and HHS decline to estimate for taxpayers the costs of this proposal; they cannot calculate the expense because (unconscionably) they do not know how long they will detain children. Meanwhile, to fund this effort, even before completing this proceeding and considering public comments, the Administration as shifted funding away from critical needs—such as Federal Emergency Management Assistance disaster relief—to family detention. And let us not forget that THE FAMILY SEPARATION CRISIS IS NOT OVER. To this day, the government continues to drag its feet, create confusion, and delay information sharing with disingenuous and shameful excuses. At no time has the government admitted that it broke the law and violated human rights when it separated families, despite the court’s finding that these actions violated the Constitution. Instead, the government continues to normalize and bureaucratize actions unconscionable to millions of Americans. The government’s implementation of family separation, its entire failure to formulate a plan for reunification prior to separation, and its carelessness in not tracking parents and children are shocking and, ultimately, disqualifying in terms of giving the Administration more latitude to assume responsibility for children’s well-being. If the Administration is counting on the American people to look the other way, Lawyer Moms of America says no. We say no to policies that expand unnecessary and indefinite incarceration, create lasting trauma for children, offer no public safety benefit, have open-ended cost estimates, and undermine the promise of America and the American immigration story. This proposal represents a significant step backward and a threat to basic protections for migrant children and families, and it must be rejected. Grassroots organizations Lawyer Moms of America and Grannies Respond/Abuelas Responden, both founded within the past six weeks in response to the humanitarian crisis caused by the U.S. government’s “zero tolerance” policy, announced today that they are partnering to stand up for migrant families. On Saturday, July 28, 2018, kids across the nation will participate in Kids Take a Stand, sponsored by Lawyer Moms of America. The premise is simple, but powerful: kids and families across the nation will host lemonade stands to raise awareness of the ongoing separation and detention of migrant families and to raise funds to speed up the safe reunification of families. All proceeds from the lemonade stands will benefit Project Corazon, a national coalition of law firms and immigration law nonprofits, to provide legal assistance for the safe reunification of families. Lemonade stands already are planned all across the country, and additional stands are being added daily as moms and families across the nation hear about Kids Take a Stand and want to get involved. Kids Take a Stand follows Lawyer Moms of America’s June 29 congressional day of action, when over 1,000 members across the country hand delivered an open letter to Members of Congress demanding an end to family separation and detention. The open letter was signed by more than 11,000 supporters and delivered to 326 Members of Congress across 49 states. On Tuesday, July 31, a group of grandmothers, grandfathers, and others, calling themselves Grannies Respond, will depart from New York City in a caravan headed to McAllen, Texas. Seeking to bring a message of love and compassion to this grim policy debate, they will stop in Reading, PA, Pittsburgh, PA, Louisville, KY, Montgomery, AL, New Orleans, LA, and Houston, TX. Each stop will includee a mix of public demonstrations, vigils, and singing with local immigrant rights, interfaith, and other activist groups. Their original caravan has become a national movement. Caravans are forming in every corner of the country, from Florida to California, to meet in McAllen, Texas, on August 6. Grannies from across the country will then engage in24 hours of action: rallies, vigils, and volunteering with local groups.. Since April, more than 2,300 children have been separated from their parents at the U.S. border as a result of the Department of Justice’s “zero tolerance” policy. Despite a court order to reunite all separated children with their parents, thousands of children remain in government custody and institutional care, in large part because the government separated them without establishing any way of tracking them. Even infants and children under 5 years old remain separated from their parents. The government has been ordered to reunite all children with their parents by July 26, and has already publicly said that meeting the July 26 deadline will be a challenge. The government’s failure to reunify families and treat them with dignity is unacceptable, and replacing family separation with family detention also is unacceptable. All concerned individuals are encouraged to hold a lemonade stand on July 28 as part of Kids Take a Stand and to join the Grannies caravan at any of their stops along the way to McAllen. You don’t need to be a lawyer, a mom, or a grandmother. “It is unacceptable that thousands of migrant children are still separated from their parents. Sometimes on the opposite sides of the country. The goal of Kids Take a Stand is to bring continued visibility to the plight of the thousands of children who have yet to be reunited. We will not rest until every single child is returned to their parents” said Tovah Kopan, a lawyer from New Jersey and co-founder of Lawyer Moms of America, the group that is sponsoring Kids Take a Stand. “Each of us lawyer moms would do anything to keep our children safe. Each of us swore an oath to defend the Constitution. We will not let this unconscionable practice stand on our watch.” Lawyer Moms of America is honored to be coordinating volunteer attorneys to support members of Grannies Respond. “Grandparents often teach their children and grandkids morality and give them a sense of right and wrong. The cruel and inhumane way that immigrant children and their families are being treated is wrong and immoral. We can’t sit still and watch children being ripped from the arms of their moms and dads. Children do not belong in cages and internment camps. These practices can cause irreparable harm to children. We have a moral obligation to act. We are riding to the border with a simple message: reunite families, end family detention, and treat all human beings with respect and dignity. We are delighted to have the support of Lawyer Moms of America during our journey,” said Roya Salehi, one of the founding Grannies of Grannies Respond. Lawyer Moms of America is a non-partisan, grassroots coalition with more than 17,500 lawyer moms and supporters across the U.S. that started with one single purpose: the immediate end to the inhumane and illegal policy of separating migrant children from their parents. Our membership spans all political parties and affiliations and all 50 states. Lawyer Moms of America started in June 2018 with five members who connected on Facebook after hearing from another lawyer mom who represented a migrant mother at the border tell of her child being forcibly taken from her arms. Grannies Respond is a spontaneous action led by grandmothers, the moral compasses of our families, to end the inhumane treatment of refugees entering our country for safety. It began as a local group of women from Beacon, NY, who wanted to “go down to the border and just do something”. In a few short weeks, it has become a nationwide movement of hundreds - if not thousands - of grandmothers across the country driving to the border to bring compassion, commons sense, and human decency to the immigration debate. Kids and families in 91 cities, across 38 states, hosted over 112 lemonade stands as part of Kids Take a Stand. These lemonade stands raised OVER $35,000! On the weekend of Saturday July 28 and Sunday July 29, kids and families in 91 cities, across 38 states, hosted over 112 lemonade stands as part of Kids Take a Stand. These lemonade stands raised OVER $35,000! Since April, thousands of children have been separated from their parents at the U.S. border as a result of President Trump’s “zero tolerance” policy. Despite a court order to reunite children with their parents, many children are still sitting alone in shelters. All proceeds from the lemonade stands will benefit Project Corazon, a program designed to help safely reunite families. Here’s how to get involved in 4 easy steps! 2. Make signs using the Kids Take A Stand logo, which you can find on this Facebook page under Photos. 4. Donate all proceeds from your stand to Project Corazon using this link through our Virtual Lemonade Stand or here. Here is our hand How-To Guide for Lemonade Stands. Together, we can take a stand by making a stand! To learn more about this cause check out our National Press Release and our Local Press Release. On June 29th, lawyers, mothers and our allies around the country gathered at our federal legislators’ offices and deliver an open letter letting Members of Congress know that swift measures must be taken to reunite the more than 2,345 migrant children who have already been separated from their parents and to prevent minors who continue to cross the border from being held indefinitely. We delivered the letter to over 326 members of Congress in 49 states. Find where we delivered here. We are Lawyer Moms of America, representing more than 15,000 lawyer moms and our allies across the country. We formed this group because we cannot abide the horror of migrant children being forcibly removed from their parents by the Department of Justice. We were called to action as citizens and as parents. We are lawyers who have sworn to defend the Constitution. We are intentionally nonpartisan. On June 19, Lawyer Moms of America released an initial open letter to Members of Congress calling for an end to the abhorrent practice of forcibly separating migrant children from their parents. On June 20, President Trump signed an Executive Order purporting to end family separation, a policy he previously claimed to have no authority to address. We are not fooled by the Executive Order. It inexplicably ignores the plight of more than 2,300 migrant children who remain separated from their families. It makes no plan to reunite them with their parents. It is well established that both immigrants and U.S. citizens have constitutional due process rights, including the right to family integrity. The interest of parents in the care, custody, and control of their children is one of the Constitution's fundamental liberty interests. The continued separation of these families is an egregious violation of procedural due process, substantive due process, and federal asylum law. It is arbitrary and capricious in violation of federal law. It must be remedied by immediate reunification. What’s more, the Executive Order cruelly replaces family separation with family detention. The President asks us to accept these as our only options. This is a false choice. The crux of the problem is the Administration’s heartless “zero tolerance” policy, which directs prosecution and detention of migrant asylum seekers even where the misdemeanor offense of “improper entry” is their only applicable violation of our law. The family separation versus family detention conundrum has emerged solely because of the Administration’s insistence on jailing asylum seekers awaiting hearing on misdemeanor charges. The Executive Order doubled down on “zero tolerance,” but settled nothing; Administration officials have offered inconsistent statements since the President signed it. And as Trump toys with this question, the basic human rights of migrant families hang in the balance. While immigration law and policy are complex, some issues are simple as matters of basic humanity. Each day separated from their families and/or held in captivity will do lasting harm to each and every one of these children. Our government has taken custody of these children— so we, as U.S. citizens, now hold responsibility for their care and well-being. They must not be held hostage while we debate comprehensive immigration reform. Requires the Department of Health and Human Services to take immediate, ceaseless, and exhaustive efforts to reunite each and every one of the more than 2,345 children who have been separated from their parents. In the absolute last resort, if no family can be located using every means possible, directs these children be placed in safe, well-documented situations that are not institutions. They should not be considered candidates for adoption in the United States. Reunification must remain the ultimate goal. Stops the Department of Justice’s cruel and ineffective policy of detaining migrant asylum seekers for the petty offense of improper entry, which leads to the separation and detention of migrant children. Ensures that migrant families remain together, outside of federal detention and institutions, pending proceedings on their asylum claims. You must act immediately. As Lawyer Moms and allies, as parents, as Americans, as humans, we take the responsibility of the care of these children as seriously as if they were our own. We implore you to act as if it is your child who has been torn from your care by a foreign government. Do everything you would wish would be done to return your own child to you. Make sure no more families are ripped apart or held in de facto internment camps. Pass legislation which provides for family unity, safe conditions, and humane treatment for migrant families seeking asylum in accordance with U.S. and international law. We will not rest until every single child is reunited with their family.